The MiCOM range of relays offers scalable levels of functionality and hardware options to best suit your protection requirements and allows you to choose the most cost-effective solution for your application. The MiCOM protection relay range provides the capability for a wide variety of protection, control, measurement, monitoring, and communication. MiCOM P921 series of voltage and frequency relays are capable of highly versatile applications and are easily integrated into both new and existing network control systems. They offer improved power quality and are an ideal cost-effective solution for maintaining system stability. By employing enhanced techniques, designed to operate under non-linear abnormalities and sub-oscillations, MiCOM P921 eliminates the risk of unwanted operations. With up to 30 output contacts, users can create simple or complex load and generation management schemes using the relay's logic capabilities. The MiCOM generator protection relays provide flexible and reliable integration of protection, control, monitoring and measurement functions. Extensive functionality is available to provide complete protection and control with five models for a wide range of applications, covering most installations from small generators up to sophisticated systems including generator-transformer applications. The variable number of opto inputs and output contacts available allow complex protection schemes to be created using the relay’s powerful but easy to use “Programmable Scheme Logic” (PSL). In addition to these basic functions, the relay carries out a large number of other functions that enable it to protect and run the motor more effectively. 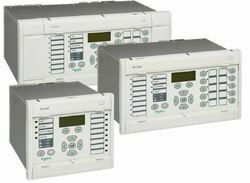 The Micom P225 Schneider Electric Relay range is designed for motor protection applications. 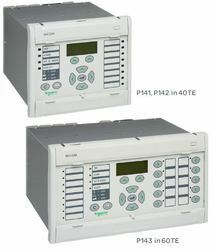 A complete set of protection functions is performed on the measurement of current, voltage and temperature. The MiCOM P63x series differential protection devices are intended for the fast and selective short circuit protection of transformers, motors, generators and other installations with two, three or four windings, respectively. The MiCOM P63x series provides high-speed three system differential protection using a triple-slope characteristic and two high-set differential elements in combination with transformer inrush restraint, overfluxing restraint and through-stabilization. Amplitude and vector group matching is done just by entering the nominal values of transformer windings and associated CTs. MiCOM P14x feeder management relays provide an integrated solution for the complete protection, control and monitoring of overhead lines and underground cables from distribution to transmission voltage levels. The wide range of auxiliary functions provides the user with sufficient information to efficiently maintain the power system and its components including circuit breakers, CTs, VTs, etc. Connecting the relay to virtually any kind of Substation Automation System or SCADA is made possible by the wide range of updated communication protocols, including IEC 61850. A range of hardware interfaces are available for easy integration into any new or legacy system. The MiCOM P14x range is suitable for all applications where over current protection is required. It is suitable for solidly earthed, impedance earthed, Petersen coil earthed and isolated systems. First application shows a parallel transformer protection where the P141 replaces many of the discrete protection elements normally associated with the LV side of the transformer. The protection includes non-directional and directional phase over current and earth fault, restricted earth fault and circuit breaker failure protection. The second application shows a P143 protecting a plain feeder using phase over current, sensitive earth fault, negative sequence over current, thermal protection and breaker failure protection. The integral auto recloser with check synchronizing can be configured to grade with downstream reclosers. The MiCOM range of relays offers scalable levels of functionality and hardware options to best suit your protection requirements, and allows you to choose the most cost effective solution for your application.The MiCOM protection relay range provides the capability for a wide variety of protection, control, measurement, monitoring and communication.The versatile hardware and common relay management software (MiCOM S1 studio) allows a simple configuration and installation in different applications.A standard and simple user interface across the entire range makes MiCOM ideal in any environment, from the more complex bay level control with mimic, to the most simple LCD display with menu interrogation. Keep informed to manage betterEvery MiCOM relay provides you with intuitive access to all system information in your own language so that so that you can manage your electrical installation effectively.If a problem occurs, clear and complete information puts you in a position to make the right decisions immediately. The electrical supply is restored without delay. 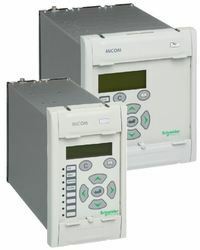 Maintain installation availabilityMiCOM relays maintain high energy availability thanks to their diagnostics function that continuously monitors the network status.In-depth analysis capabilities and high reliability ensure that the equipment is de-energised only when absolutely necessary. Risks are minimised and servicing time reduced by programming maintenance operations. MiCOM series allows complete optimisation of your solution. The MiCOM generator protection relays provide flexible and reliable integration of protection, control, monitoring and measurement functions. 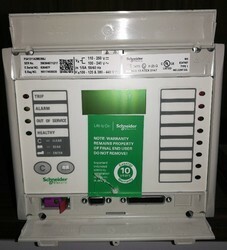 Extensive functionality is available to provide complete protection and control with five models for a wide range of applications, covering most installations from small generators up to sophisticated systems including generator-transformer applications.The variable number of opto inputs and output contacts available allow complex protection schemes to be created using the relay’s powerful but easy to use “Programmable Scheme Logic” (PSL).